Los Angeles County Sheriff's Department Compton Station is advising Jonathan Barnes has been found safe and in good condition. Thank you to the public, the media, Aero Bureau, and deputy personnel for their tireless efforts in the search for Jonathan. 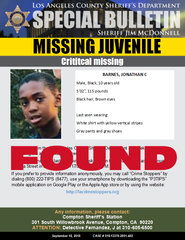 Los Angeles County Sheriff’s Department’s Compton Station detectives are asking for the public’s help in locating Critical Missing Juvenile Jonathan Barnes. He is a 10 year-old male Black who was last seen with a basketball in the area of Cookacre Avenue and Olanda Street in Lynwood on Monday, September 17, 2018, at approximately, 7:30 p.m.
Jonathan is described as 5’02” tall, 115lbs., short black hair, and brown eyes. He was last seen wearing a white shirt with yellow vertical stripes, gray pants and gray shoes. His caregivers have not seen or heard from him. They are very concerned and asking for the public’s help in located him.